Billionaire entrepreneur Elon Musk released rough plans last week for a "Hyperloop" that would shoot capsules full of people at the speed of sound through elevated tubes connecting Los Angeles and San Francisco. Then he urged the public to improve on them. A U.S. firm hustled out a model using a 3-D printer. Another company is testing a virtual Hyperloop with sophisticated computer software. In San Francisco, enthusiasts interested in "making Hyperloop a reality" will meet over beers. Meanwhile, Musk himself has put aside the project and returned to his established transportation ventures: luxury electric car maker Tesla Motors Inc. and the rocket-building company SpaceX. In principle, the Hyperloop is possible. The concept pulls together several proven technologies: Capsules would float on a thin cushion of air and draw on magnetic attraction and solar power to zoom through a nearly air-free tube. Because there would be so little wind resistance, they could top 700 mph (1,125 kph) and make the nearly 400-mile (643-kilometer) trip in about half an hour. Actual construction would hinge on challenges far more complex than advanced engineering—those involving money and politics. 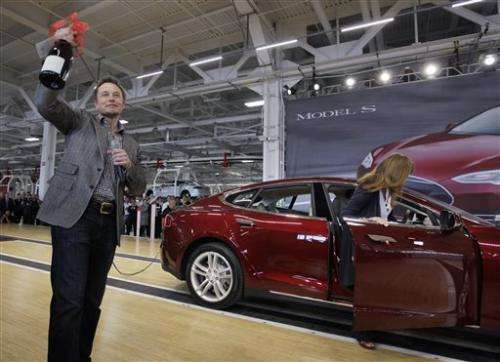 Musk projected a $6 billion cost, but some say that's too low. Others suggested his timeframe of a decade to completion was naive—that getting political backing and environmental clearances, much less land to build the tubes on, would be hugely time-consuming. Conspicuously absent was a commitment that Musk would sink substantial money into the project anytime soon—if ever. On a call with reporters, Musk suggested he might build a "subscale" test version in a few years if the idea was floundering. One thing Musk was clear about: The public should participate in questioning, modifying and, ultimately, perfecting his proposal (www.spacex.com/hyperloop). 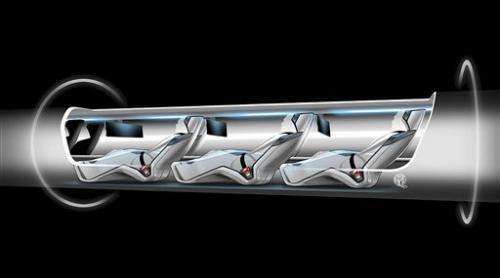 Sandeep Sovani, the company's director of Global Automotive Industry, said he has long been intrigued by tube travel (an idea that predates the Hyperloop by a century) and wanted to do a model both out of intellectual curiosity. Start a Kickstart so all the fans can put their money where their mouth is. Get Disney to partner with the state of Florida and build one from Disney World to Miami and another from Disney World to Orlando. Or do the same kind of public-private partnetship and build one from the Las Vegas casinos to Salt Lake City or Hollywood. The big Hotel/Casino Companies and Disney can both afford to chip in a sizeable amount of money and they both like this kind of over-the-top project. If you build one in the right place, it would pay for itself in a reasonable amount of time, and maybe even make money. Another avenue of funding would be getting an airline industry partner to invest in it, and connect two of the big airport hubs, like Chicago and Saint Louis or Saint Louis and Atlanta. Or hit up the resort companies and connect the Bahamas to Florida. LA to SD isn't gonna get funded because you're not giving any specific industry or company a chance to make a pile of money from it. The Florida route is ideal. Lots of flat empty land. I would definitely say that no matter where the first one gets built, it should not be in a place where any kind of construction project will be over-burdened by red tape and high costs. You don't build a prototype system of this nature in LA, NYC, Boston, DC, etc. Build a smaller capacity system intended to serve a shorter route first, so you can work out all the unforseen engineering glitches and get some real world data on operating costs and reliability. Build the prototype in a State where regulations, labor and land are reasonable. Let California go ahead with its bullet train, so you can compare your success to theirs, dollar for dollar. I think this would cost an astronomical amount of money to construct and maintain. No one would want to be cooped up in a tiny tube, and when you scale it up to the size of a bus or train, it would be a large tube, with no air pressure, think about how many things could go wrong! The amount of energy at play in that type of machine would be enormous. What would happen during an earthquake? I for one would love to see this built, but I think High Speed trains are much easier to build and maintain, and are as fast as they need to be. Only Americans would think building this thing is important when nearly one in four of our children live in poverty. I wouldn't put money into this idea without some basic engineering studies. For one thing, I'm wondering about the rise in temperature caused by friction. Seems to me, the air in that tube could heat up the passenger vehicle and cook the occupants.